I also went for gluten-free corn tortillas instead of bread, which I think was ideal! However, feel free to enjoy this salad on any bread of your choice. UPDATE: And for the second batch (because the first batch disappeared fast, I swapped out the carrots with the promised purple cabbage and water chestnuts. Divine)! 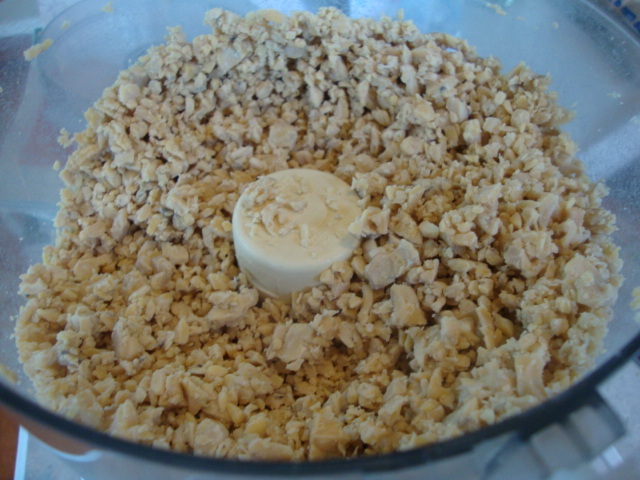 Using a fork or pastry blender, mash the chickpeas until chunky. Add the rest of the salad ingredients. In a medium bowl, whisk together the miso and water, then add the rest of the sauce ingredients; combine well. Add the sauce to the chickpea mixture and stir together thoroughly. Top a tortilla with some lettuce and scoop the salad on top. Enjoy! I find it's easy to fall into a lunch rut, especially when you don't have a lot of time to pull something together. The beauty of this salad is that you spend 20 minutes in the kitchen preparing it, but it can last you several days. (I promise you won't get bored with it!) The chickpeas (or garbanzo beans) are an excellent source of protein, so they'll keep you going through the afternoon slump. 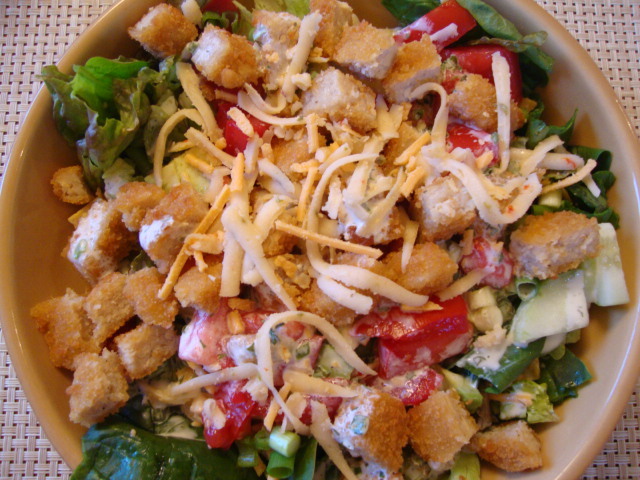 I love crunch in my salads, so there's plenty of that between the celery, carrots, bell pepper, and pepitas. (I had to stop myself from adding water chestnuts and/or red/purple cabbage--next time!) Lately, I've been buying the mini sweet peppers which are ideal for snacking, so while the recipe calls for ½ a red bell pepper, I used 2 of the mini peppers. I also went for gluten-free corn tortillas instead of bread, which I think was ideal! However, feel free to enjoy this salad on any bread of your choice. The joy of cooking for two means saving money at the grocery store and saving time in the kitchen; these bowls are fresh and flavorful in less than 30 minutes. The downside? No leftovers. Steam the carrots until softened, about 12-15 minutes. Meanwhile, cook the glass noodles in boiling water for 6 minutes. Drain, rinse with cold water and return to the pan with a tiny bit of sesame oil. Whisk together all of the sauce ingredients. Combine the carrots, noodles, green onion, and sauce in a pan or bowl. Serve with sesame seeds on top. Enjoy! Steam the carrots until softened, about 12-15 minutes. Meanwhile, cook the glass noodles in boiling water for 6 minutes. Drain, rinse with cold water and return to the pan with a tiny bit of sesame oil. This amazing dish will be ready in less than 30 minutes but will taste like you spent a good hour on it. I came across Viviana Foods gluten-free & vegan lemon garlic orzo and it looked pretty interesting, so I thought I’d give it shot. The orzo is ready in about 7 minutes and all I had to do was just had to chop some veggies and herbs and saute some for just a few minutes. The flavor is fantastic; I only seasoned it with a tiny bit of salt and pepper. The only downside is that the orzo costs around $7! Yeah, it was a splurge. I guess I was so drawn to the cute little package. So it may not be something I’d buy on a regular basis, but it really was tasty! Cook the pasta in boiling water for 6-9 minutes. Test it for doneness. You’ll want to use a fine mesh strainer to drain the orzo, otherwise you’ll pretty much lose most of it down the drain. Rinse with hot water and return to the pan. While it’s cooking, however, heat the olive oil in a skillet and add the mushrooms and green onion. Saute over medium heat for about 4-5 minutes—just until the mushrooms start to cook down. Fold the mushrooms and green onions into the orzo and season with salt and pepper. Top individual servings with some basil and tomatoes. Enjoy! Cook the pasta in boiling water for 6-9 minutes. Test it for doneness. You'll want to use a fine mesh strainer to drain the orzo, otherwise you'll pretty much lose most of it down the drain. Rinse with hot water and return to the pan. While it's cooking, however, heat the olive oil in a skillet and add the mushrooms and green onion. Saute over medium heat for about 4-5 minutes---just until the mushrooms start to cook down. Fold the mushrooms and green onions into the orzo and season with salt and pepper. Top individual servings with some basil and tomatoes. Enjoy! I’m finally back with a new recipe! As much as I love them, I don’t use pine nuts often because they’re rather pricey, but I picked some up on sale. They add such a decadent flavor to dishes and this is no exception. Combined with cashews, they make an ideal stuffing for ravioli. The fresh veggies on top complete the meal. You can soak the nuts for several hours to overnight, or to speed things up, in a medium bowl, pour boiling water over the nuts and let sit for 2 hours. Sometimes, I only soak them for an hour or so; I don’t mind if the filling isn’t perfectly smooth, so it’s up to you. To prepare the dough, whisk together the two flours and the salt. Whisk in the warm almond milk and oil. Sometimes it’s easier to use your hands to combine everything; use what works. Transfer the dough to a very lightly floured surface and knead for 5-7 minutes until the dough is smooth. Cover in plastic wrap and set aside. To make the filling, drain the nuts and add them to a food processor. Process them for about 30 seconds to get them a bit pureed. Add the rest of the ingredients and puree 1-2 minutes until smooth. Set aside. As you probably recall, I like to use my pasta maker and a ravioli plate to make raviolis, and I have to say, the process gets easier and quicker each time. I recommend at least getting a ravioli plate—you can find one for under $20 on Amazon. I ended up with 44 raviolis . . . I then let them sit for about 20 minutes. Meanwhile, I prepared the topping. In a small bowl, combine the tomatoes and basil; season with salt and pepper. In a medium skillet, heat the Earth Balance and add the garlic. Saute for 3-4 minutes, then add the mushrooms. Cook for two minutes, then add the wine and cook another 2-3 minutes, or until the mushrooms soften. Remove from heat and stir in the tomatoes and basil. Bring a large pot of water to a boil and cook the ravioli (about a dozen at a time) for 3-5 minutes. They will float to the top and puff up a little when they’re ready. I usually serve them as they finish cooking so they stay hot. If you want to cook them all first, I suggest transferring them to a large, oiled baking sheet. Otherwise, they’ll stick together. Serve with a scoop or two of the fresh topping and enjoy! As much as I love them, I don't use pine nuts often because they're rather pricey, but I picked some up on sale. They add such a decadent flavor to dishes and this is no exception. Combined with cashews, they make an ideal stuffing for ravioli. The fresh veggies on top complete the meal. You can soak the nuts for several hours to overnight, or to speed things up, in a medium bowl, pour boiling water over the nuts and let sit for 2 hours. Sometimes, I only soak them for an hour or so; I don't mind if the filling isn't perfectly smooth, so it's up to you. To prepare the dough, whisk together the two flours and the salt. Whisk in the warm almond milk and oil. Sometimes it's easier to use your hands to combine everything; use what works. Transfer the dough to a very lightly floured surface and knead for 5-7 minutes until the dough is smooth. Cover in plastic wrap and set aside. To make the filling, drain the nuts and add them to a food processor. Process them for about 30 seconds to get them a bit pureed. Add the rest of the ingredients and puree 1-2 minutes until smooth. Set aside. As you probably recall, I like to use my pasta maker and a ravioli plate to make raviolis, and I have to say, the process gets easier and quicker each time. I recommend at least getting a ravioli plate---you can find one for under $20 on Amazon.I ended up with 44 raviolis. I then let them sit for about 20 minutes. Meanwhile, I prepared the topping. In a small bowl, combine the tomatoes and basil; season with salt and pepper. In a medium skillet, heat the Earth Balance and add the garlic. Saute for 3-4 minutes, then add the mushrooms. Cook for two minutes, then add the wine and cook another 2-3 minutes, or until the mushrooms soften. Remove from heat and stir in the tomatoes and basil. Bring a large pot of water to a boil and cook the ravioli (about a dozen at a time) for 3-5 minutes. They will float to the top and puff up a little when they're ready. I usually serve them as they finish cooking so they stay hot. If you want to cook them all first, I suggest transferring them to a large, oiled baking sheet. Otherwise, they'll stick together. Serve with a scoop or two of the fresh topping and enjoy! Every week, when I’m writing up a grocery list, I always ask for dinner suggestions. It never fails. “Tacos.” It’s become a joke around here. When I saw this recipe on Pinterest for Oven Tacos, I knew my hegans would be very happy with a vegan version. These were definitely a hit. I had to laugh when the original recipe said that after the ground beef is cooked (yack!) “drain the liquid.” Oh, just say what it is! Grease! Melted animal fat! Ahhh . . . 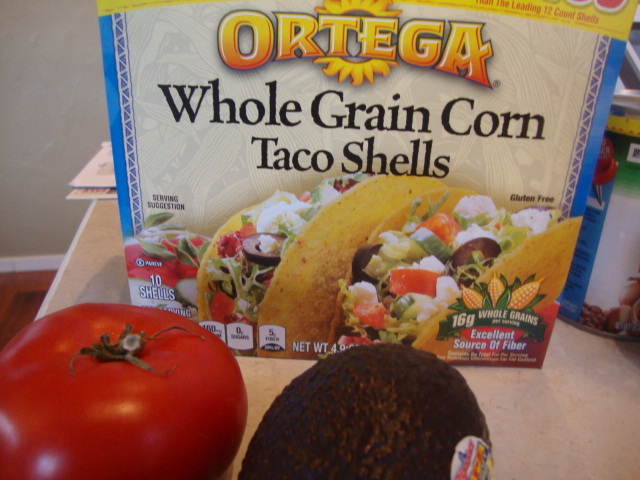 I love it; being vegan means never having to say, “drain the liquid/grease/fat.” Speaking of which, the Boca crumbles have zero fat, I use “no fat” refried beans, and there is no fat in the tomato sauce. Obviously, these aren’t totally fat free, but can you imagine the fat content alone in the original ones? Yikes! So, not only are these amazing, they’re actually healthy for you. 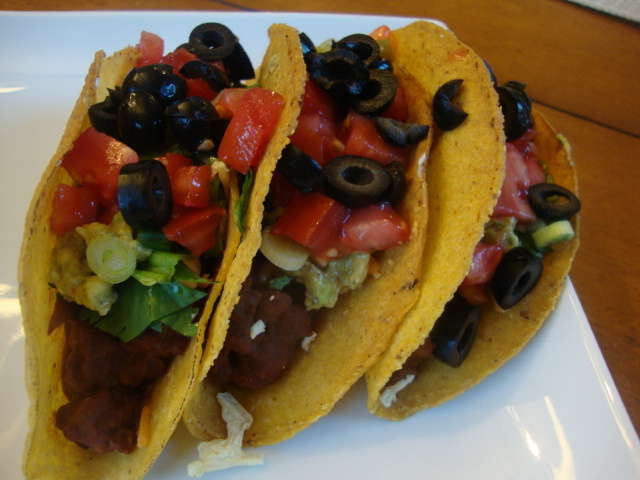 I’ve discovered these great whole grain taco shells that really are delicious. Psst . . . by the way, this makes A LOT. I made 13 tacos and had some filling left over, so I recommend either serving these to a crowd, or freezing half the filling for the next taco night. Preheat the oven to 400. In a large skillet, heat the olive oil. Add the onion and saute until softened and beginning to brown. Add the Boca Crumbles and cook 4-5 minutes, or until they are heated through. (No need to drain any “liquid”)! In a small bowl or measuring cup, combine the seasoning mix with 1/2 to 3/4 C of water; stir into the Boca mixture. Next, add the tomato sauce, green chilies, and beans. Combine well over medium-low heat. 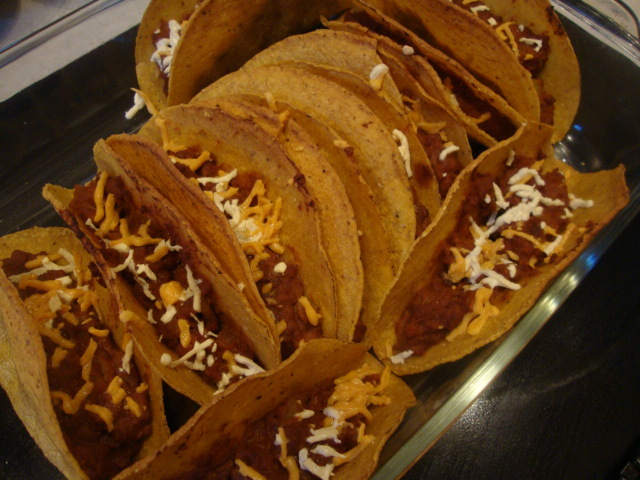 Fill the taco shells with the mixture. I wanted to leave plenty of room for toppings, so I filled them about a third of the way up, but feel free to use as little or as much as you want. 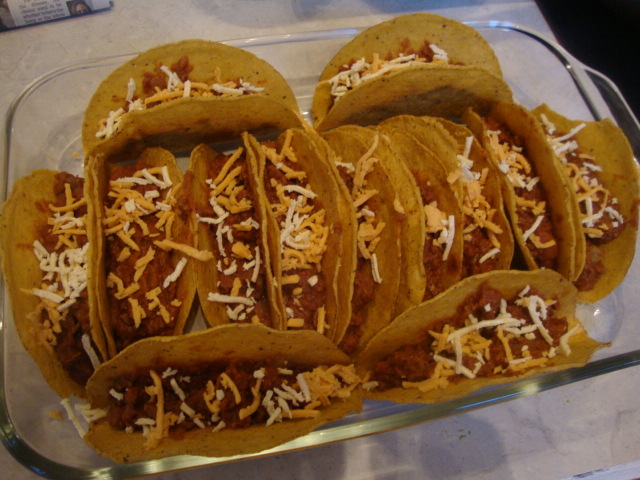 Like I said, I made 13 tacos—enough to fill a 9×13 baking dish, so if you’re making more, you’ll want a larger dish. And be careful, they break easily with the thick filling inside (especially after they’re baked). Sprinkle with some Daiya cheese. Bake for 10 minutes. The bottom portion of the shell (that has the Boca filling) will have the awesomeness of a soft taco, but the flavor of corn. THEN, the top half is crunchy—best of both worlds! Load them up with your favorite toppings and enjoy! In a large skillet, heat the olive oil. Add the onion and saute until softened and beginning to brown. Add the Boca Crumbles and cook 4-5 minutes, or until they are heated through. In a small bowl or measuring cup, combine the seasoning mix with ½ to ¾ C of water; stir into the Boca mixture. Next, add the tomato sauce, green chilies, and beans. Combine well over medium-low heat. 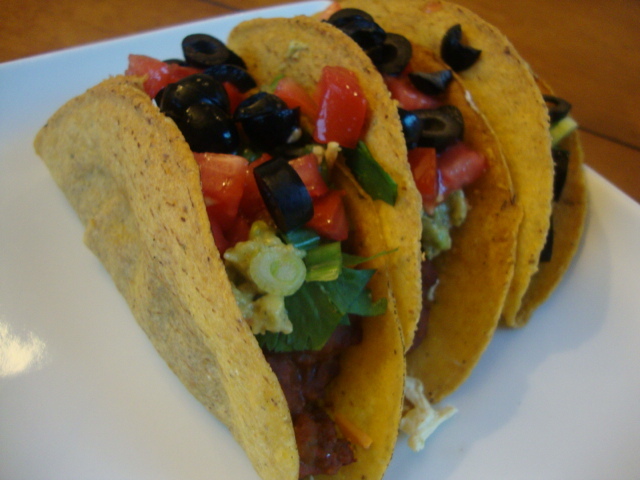 Fill the taco shells with the mixture. I wanted to leave plenty of room for toppings, so I filled them about a third of the way up, but feel free to use as little or as much as you want. Like I said, I made 13 tacos---enough to fill a 9x13 baking dish, so if you're making more, you'll want a larger dish. And be careful, they break easily with the thick filling inside (especially after they're baked). Sprinkle with some Daiya cheese. Bake for 10 minutes. The bottom portion of the shell (that has the Boca filling) will have the awesomeness of a soft taco, but the flavor of corn. THEN, the top half is crunchy---best of both worlds! 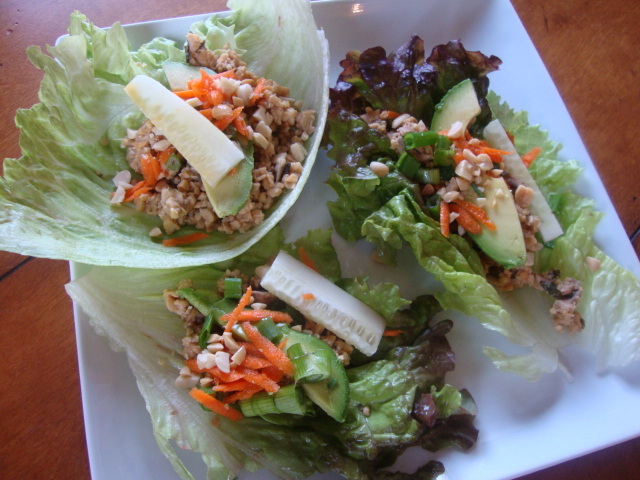 Lettuce wraps are a favorite around here, especially since we can be picky and add what toppings we want. Oh, and they’re fresh and easy to make. I suggest having all of your ingredients out, ready to go, and even chopped before anything else; it just makes life easier. I was inspired by a Vegetarian Times recipe, but I made lots of changes by adding ingredients and omitting some. That’s the beauty of these . . . they’re so versatile. 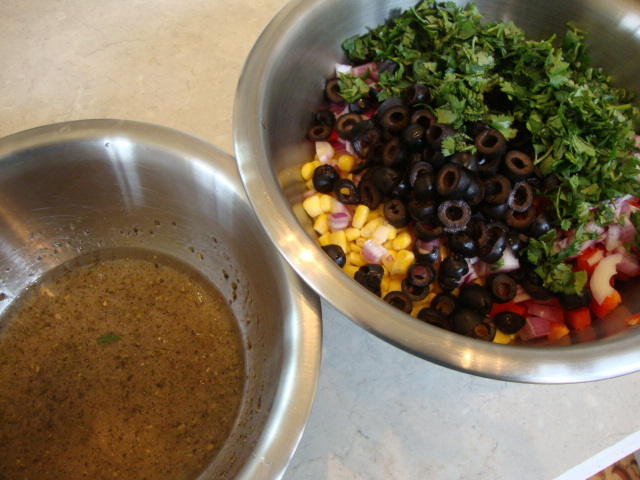 Whisk together the sauce ingredients in a small bowl and set aside. 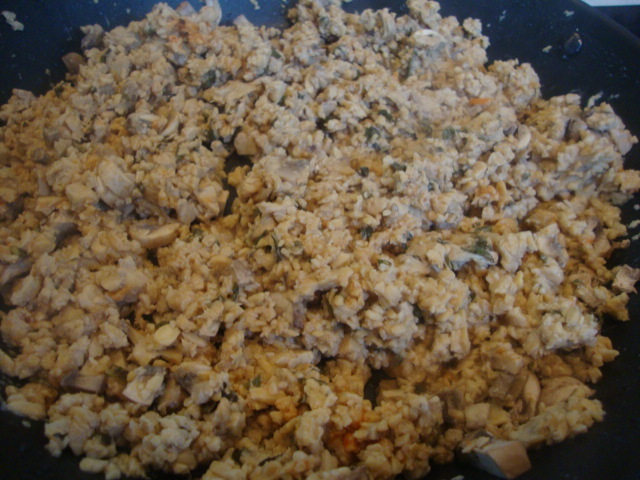 To make the filling, pulse the tempeh in a food processor. Depending on your preference, you can pulse it until you’re left with course pieces, or process it a bit more like I did. It can be difficult to get a consistent texture if you want larger pieces. Heat the oil in a large skillet and add the ginger and garlic. Cook for 1 minute, then add the tempeh (and water chestnuts, if suing) and broth. Cover and cook over medium heat for 5 minutes. Uncover, add the mushrooms, increase heat to medium-high, and cook ten minutes. 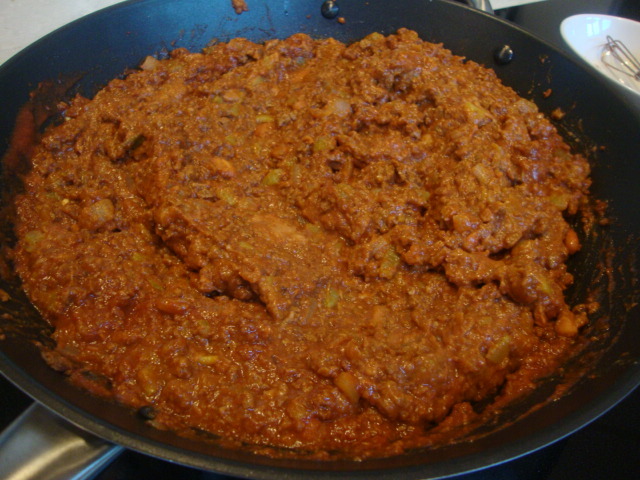 Stir in the remaining filling ingredients and heat thoroughly. Since you were so efficient in your prep work . . . 😉 you’re ready to fill the lettuce wraps! Place a scoop in the center of the lettuce leaf and add your favorite toppings, and drizzle with about a tablespoon of the sauce. Enjoy! 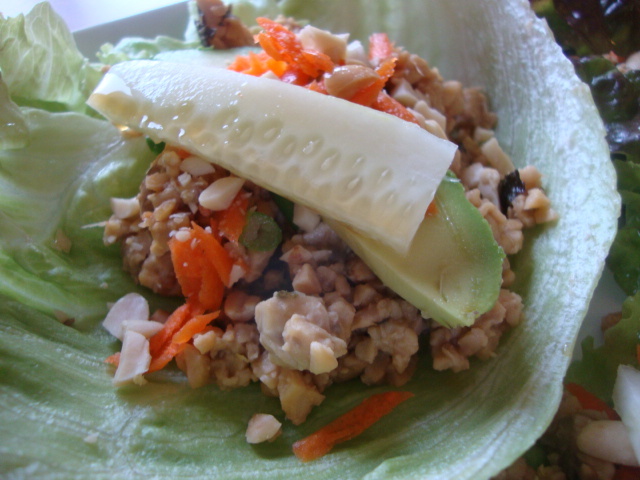 Lettuce wraps are a favorite around here, especially since we can be picky and add what toppings we want. Oh, and they're fresh and easy to make. I suggest having all of your ingredients out, ready to go, and even chopped before anything else; it just makes life easier. I was inspired by a Vegetarian Times recipe, but I made lots of changes by adding ingredients and omitting some. That's the beauty of these . . . they're so versatile. Whisk together the sauce ingredients in a small bowl and set aside. To make the filling, pulse the tempeh in a food processor. Depending on your preference, you can pulse it until you're left with course pieces, or process it a bit more like I did. It can be difficult to get a consistent texture if you want larger pieces. Since you were so efficient in your prep work . . . 😉 you're ready to fill the lettuce wraps! Place a scoop in the center of the lettuce leaf and add your favorite toppings, and drizzle with about a tablespoon of the sauce. Enjoy! Beware: This feeds a crowd . . . and . . . you can easily fill up on this salsa before dinner because it’s so delicious! It’s packed full of flavor and would be ideal for a summer get together. (yes, it’s December, but avocados were on sale). The recipe is from All Recipes, but I just made a couple of changes such as using red onion instead of yellow and adding 1 cup of fresh cilantro. Dig in! 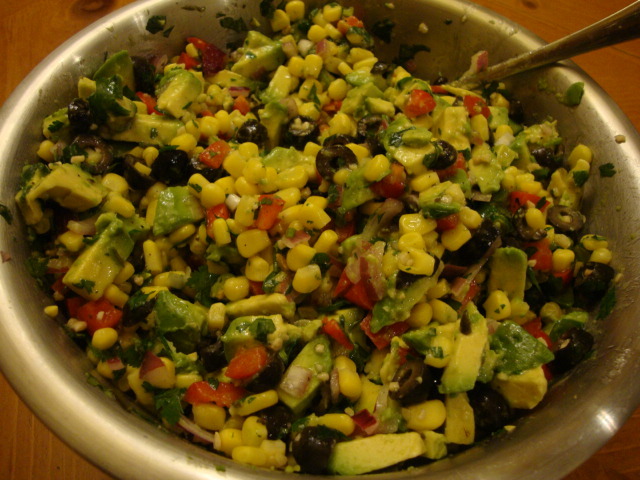 In a large bowl, mix corn, olives, red bell pepper, onion, and cilantro. In a small bowl, mix garlic, olive oil, lemon juice, cider vinegar, oregano, salt and pepper. Pour into the corn mixture and toss to coat. Cover and chill in the refrigerator 8 hours, or overnight. (I didn’t have time to let it sit that long. I chilled it for about 4 hours). Stir avocados into the mixture before serving with tortilla chips or toasted baguette slices. Enjoy! Beware: This feeds a crowd . . . and . . . you can easily fill up on this salsa before dinner because it's so delicious! It's packed full of flavor and would be ideal for a summer get together. (yes, it's December, but avocados were on sale). The recipe is from All Recipes, but I just made a couple of changes such as using red onion instead of yellow and adding 1 cup of fresh cilantro. Dig in! Pour into the corn mixture and toss to coat. Cover and chill in the refrigerator 8 hours, or overnight. (I didn't have time to let it sit that long. I chilled it for about 4 hours). Stir avocados into the mixture before serving with tortilla chips or toasted baguette slices. Enjoy! This salad is a staple around my house and each time I make it, I never learn. I eat way too much of it. It’s just so damn good. Not to mention, easy to make. Bake some meatless chicken nuggets and throw some fresh veggies together and you have a healthy meal in minutes. I tend to put everything in separate bowls and let everyone create their own salads. To make the dressing, just whisk everything together in a small bowl and transfer to a pourable container. Refrigerate the leftovers. Enjoy! This salad is a staple around my house and each time I make it, I never learn. I eat way too much of it. It's just so damn good. Not to mention, easy to make. Bake some meatless chicken nuggets and throw some fresh veggies together and you have a healthy meal in minutes. The Epicurean Vegan is devoted to those wanting to eat healthy, save animals, and reduce their carbon footprint. My decision to go vegan started out as a quest to get healthier, but the more I learned about veganism, the more I realized how damaging the meat and dairy industries are to the environment and, of course, the animals. And it is for these reasons, that I would never go back to eating or wearing animal products. Ever. Enter your email address to receive recipes to your inbox.